Aroha lead the organisation of the 1993 conference that developed the Mataatua Declaration on the Cultural & Intellectual Property Rights of Indigenous Peoples and has remained focused on these issues ever since at local, national, regional and international levels. She has published extensively on indigenous intellectual property and biocultural heritage issues and has been invited to present to sessions of the World Intellectual Property Organisation-IGC, and to expert workshops convened by a range of UN bodies including the UN Permanent Forum on Indigenous Issues, Expert Mechanism on the Rights of Indigenous Peoples, Convention on Biological Diversity, UNESCO and Intergovernmental Platform on Biodiversity and Ecosystem Services (IPBES). 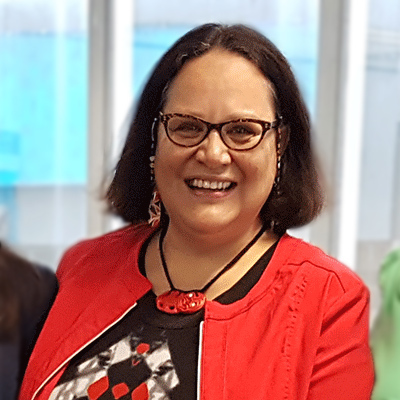 She is a member of the Trademarks Māori Advisory Committee, as well as the Repatriation Advisory Panel of Te Papa Tongarewa and is on the Kahui Māori of the Deep South Climate Change National Science Challenge as well as the Kahui of The Genomics Aotearoa Platform. Her past roles have included being Director of the Māori Business Unit of the Victoria University Business School, Policy Manager, Te Puni Kokiri (Cultural Heritage & Indigenous Issues Unit). She was elected by the World Conservation Congress to Chair the IUCN Commission on Environmental, Economic & Social Policy in 2008 and re-elected in 2012. Since retiring from that role Aroha now works as an independent researcher on a range of projects looking at Mātauranga Māori/Indigenous Knowledge and Biodiversity issues. Of all her many roles, Aroha says the most rewarding role is being Mum to Hinetaapora and Te Taiawatea and Nan to Cyrus Rewi.